You can setup the camera position by entering coordinates and values in the Layer Properties view. Position Displays the current position of the camera layer using X-axis (East/West), Y-axis (North/South) and Z-axis (Forward/Backward) coordinates. 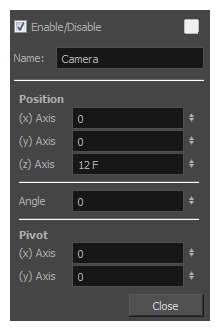 To reposition your camera frame, type in the new values corresponding to the desired position coordinates. You can also use the up and down arrows to set the value of each field—see About the Layer Properties View. Pivot Displays the current position of the rotation pivot of the camera layer. The camera will perform a rotation taking the position of the pivot as its angle centre. By default, the pivot is set at the centre of the camera frame. To reposition the pivot point, enter new X and Y coordinates values in the appropriate field. To see the pivot's position, the Rotate tool must be selected.